A program for international students who want to complete their secondary schooling in the US. The American Success and American Honors High School Completion programs provide a supportive, challenging global education experience. 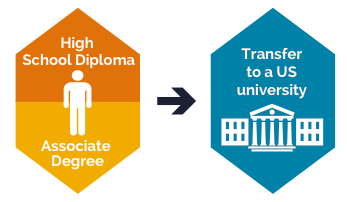 At the end of the program, students can earn an associate degree and high school diploma to then transfer to a leading US university to complete a bachelor’s degree. Enjoy an engaging curriculum in an environment that makes it easy to connect with professors and peers. From enrollment through transfer, students receive personalized guidance on everything from your degree plan and course selection to financial aid and the transfer process. Students must be 16 years old by the first day of class and enrolled full-time to be eligible for the program. All students must live in a homestay until they are 18 years old. Students are evaluated for academic readiness after arriving on campus and will partner with an advisor to determine an optimal coursework plan. Students seeking English language preparation prior to enrolling in the high school completion program may enroll in the American Success program and transition once English proficiency standards are met.